Over 18 years Grosvenor has offered up nearly 150,000 lots, selling for over £70 million, and has risen to become the UK’s leading specialist philatelic auction house, celebrated for its carefully prepared, collector-friendly, consignment-only auctions. A week of four special sales was held in London between Monday 9th and Thursday 12th November as a celebration of the landmark 100th auction and achieved a fantastic cumulative total of £2,038,097, all four auctions exceeding their pre-sale expectations. Honoured as the 100th Grosvenor auction, the second part of the prestigious Golden Collection of Great Britain brought to the market an exceptional presentation of mint/unused stamps and specimens from the reigns of Queen Victoria and King Edward VII. Among the many rarities on offer were attractive examples of the ever popular 1840 V.R. 1d. black (lot 29, above) that climbed to £8,925 (despite a trivial surface imperfection) and the very scarce 1882 Watermark Anchor £1 brown-lilac on blued paper (lot 294) that reached £35,612, although lacking its original gum. 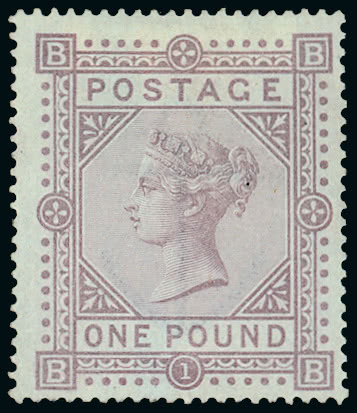 Among an impressive range of rare Official stamps the 1885 Inland Revenue £1 brown-lilac (lot 422) found a new owner for £15,470, having previously graced the collections of U.S. millionaire Arthur Hind and King Carol of Romania. The Specialised Great Britain auction that followed placed on offer a comprehensive range of material that included a fine collection of 1d. reds formed by the late Dr. W.F. 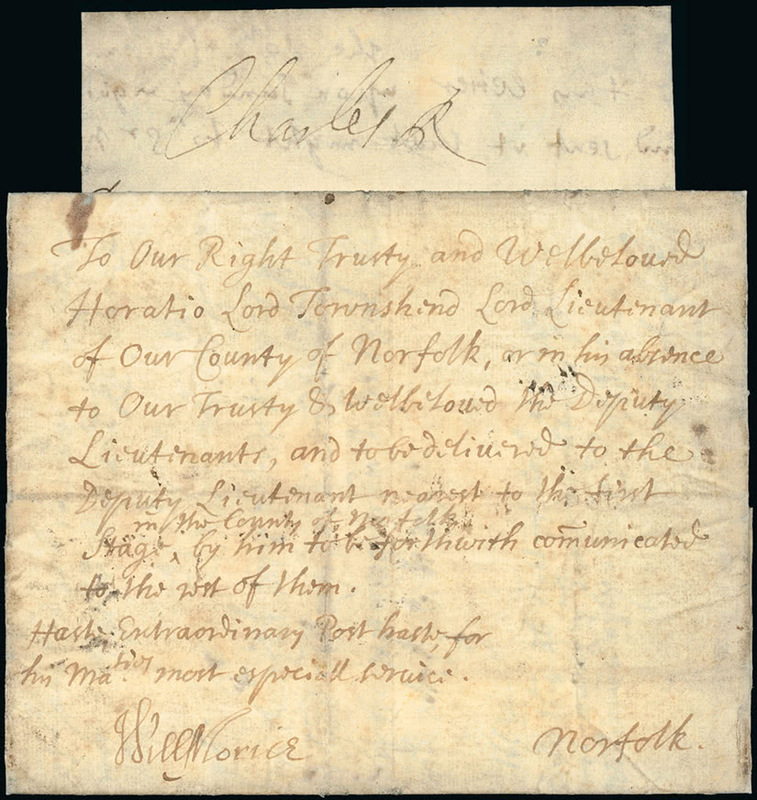 Maddams as well as a superb offering of the postal history of Norfolk including items from the fine collection of Patrick Pearson RDP, FRPSL. In this sale a used example of the extremely rare plate 168 of the 1854 1d. 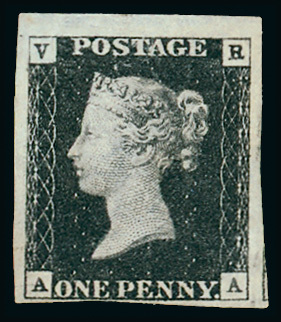 die I, alphabet II, SC16 with matched imperforate (lot 1816), suffering slight imperfections but believed to be one of only five known examples, achieved £4,912. 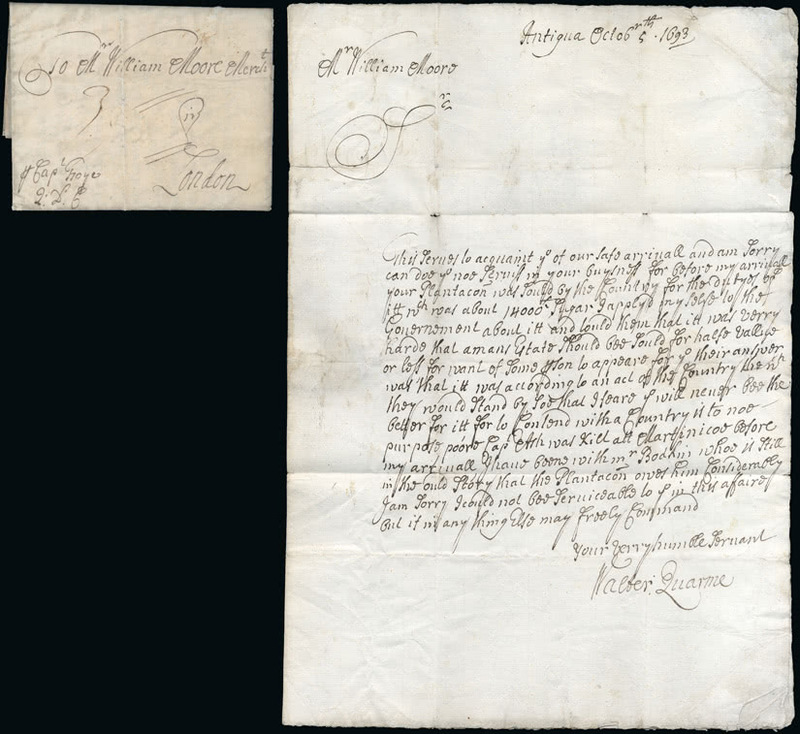 Two historic letters signed by King Charles II and sending military instructions to Norfolk (lots 1351, 1354) attracted great interest, climbed steadily to realisations of £10,069 and £4,298 respectively. 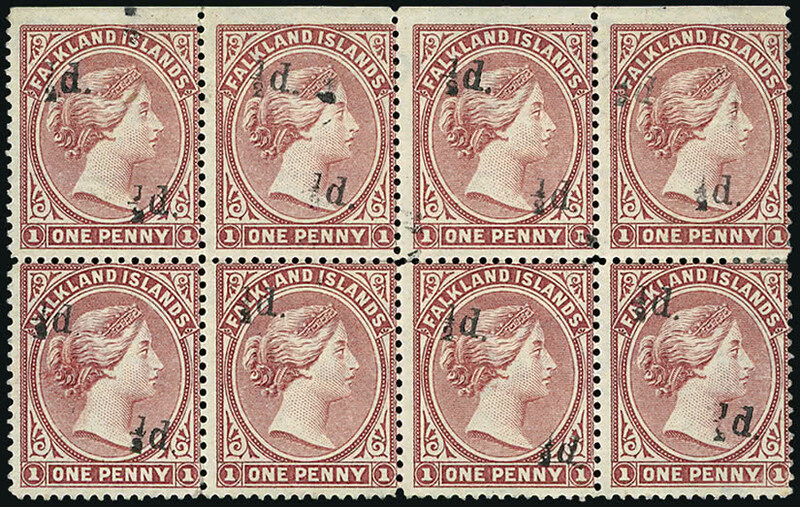 An exceptional mint corner block of twelve of the 1912 5s. 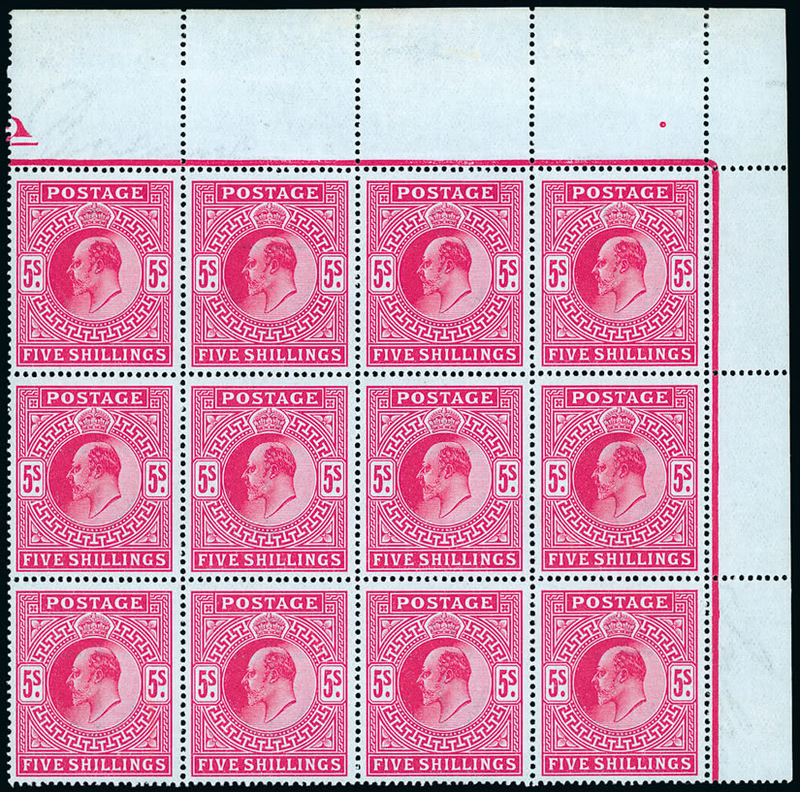 carmine, Somerset House printing (lot 2054), sold well for £6,140 and, although the market for Queen Elizabeth II errors is by no means at its strongest at present the 1964 Botanical 9d. (ordinary paper) showing green (leaves) omitted (lot 2366) achieved £7,368. 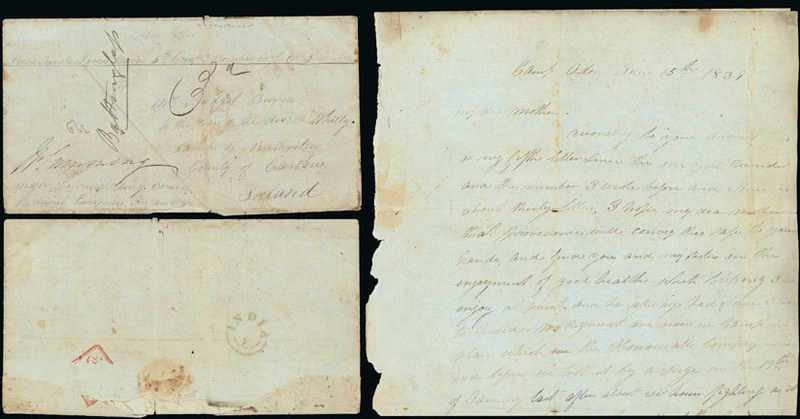 These sales will be long remembered by many collectors for having brought the earliest known letters from three countries, Aden, Antigua and the Falkland Islands, all to the market in the same week. The Gary Brown Collection of Aden Postal History was the finest assembly of this area ever compiled and was received with great acclaim by fellow specialists. 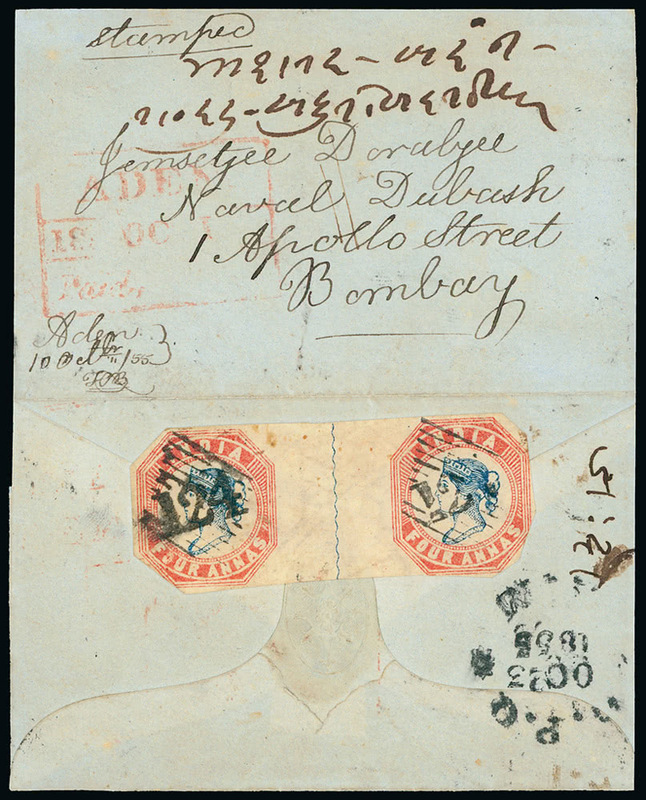 Dating from shortly after the British annexation in 1839, the earliest known entire (lot 4001) reached £2,737 whilst the stunning front cover item, an 1855 envelope bearing India 4 anna pair on reverse (lot 4036, left) soared to £13,685. 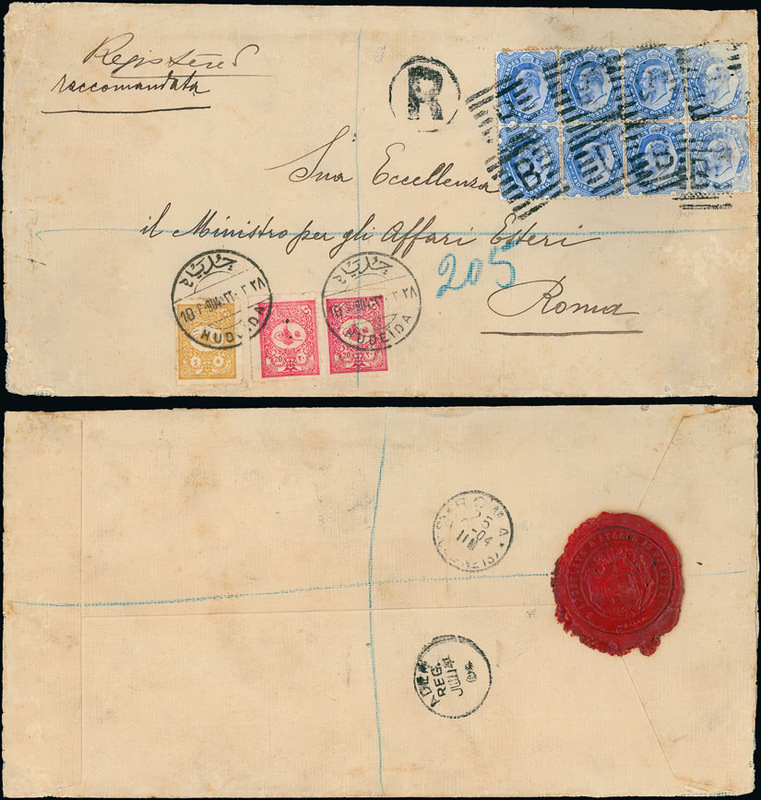 The large 1904 registered cover sent from the Italian Consulate at Hodeida to the Ministry of Foreign Affairs in Rome and showing the only known Aden/Yemen mixed franking (lot 4142) was strongly bid to £11,900. A very strong auction of British Empire & Foreign Countries opened with the exceptional John Stetson Murdock Collection, the second specialised presentation of Falkland Islands offered by Grosvenor this autumn. 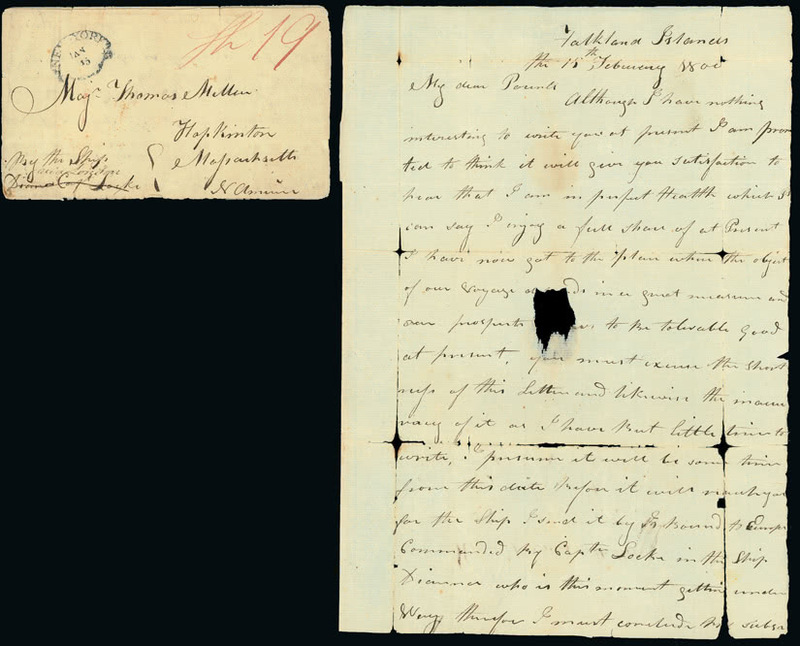 In view of the great scarcity of items sent from the islands prior to the 1833 reassertion of British sovereignty the earliest recorded item, a letter sent to Massachussetts in 1800 (lot 5001), did not entirely surprise with its realisation of £11,298. Equally impressive was the record £36,840 paid by the successful purchaser of the largest known multiple of the 1891 Provisional Surcharge 1d. claret (lot 5026, above), truly a ‘Crown Jewel’ of Falklands philately. The Bob Avery Liechtenstein, the Tom Butlin Sierra Leone, further offerings from the Moore & Moore collection of Gibraltar and the R.J. Maddocks Cameroons all stood up well with a number of notable prices achieved. 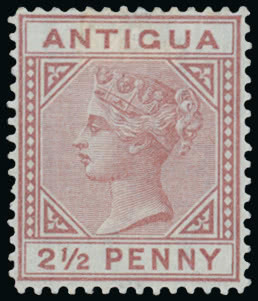 An outstanding offering of Antigua that included the fine ‘Pearce & Pearce’ Collection featured rare postal history and stamps, both proving popular. 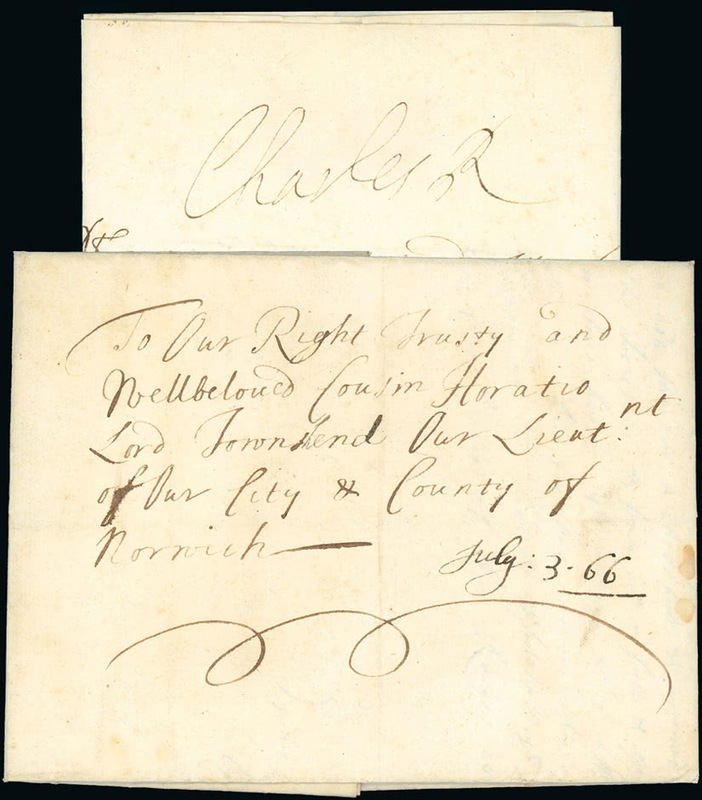 The earliest known letter (lot 5374) dating from 1693 was strongly bid to £2,456 whilst a fine example of the 1879 21/2d. 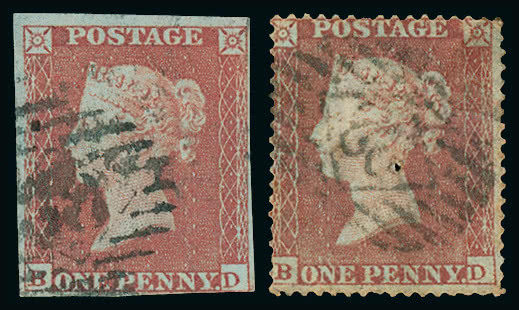 red-brown with slanting foot to “2” variety (lot 5422, left) exceeded its catalogue value with a £11,424 realisation. Such was the response to this special week of auctions that firm conclusions regarding the current state of the market should not be drawn, although a fear that there is an increasing lack of support in depth for the ‘classic’ stamps of particular countries must be acknowledged. The next Grosvenor auction will be that of the Kiddle Brothers Collection on February 24th 2016, and will present a fascinating range of unusual material – from Australian States revenues to Mexico express mail. Full listings of prices realised at each auction may be downloaded from the Grosvenor website www.grosvenorauctions.com. Prices quoted include buyer’s premium and taxes. Please contact Andrew Williams at Grosvenor for further information on past and future auctions.